• The third studio album from British indie band Foals, Holy Fire was produced in North London and features the single "Inhaler". The Oxford outfit finally evolves a sound to suit its mainstream status. • Foals’ moniker made perfect sense in the mid-00s. Their early singles were spindly affairs, capable of kicking out but occasionally awkward of movement. The Oxford five-piece swiftly suffered restrictive pigeonholing: “math-rockers” never had much of a chart-busting ring to it. • So much buzz and hype – enough to drown most bands. But Foals’ debut, 2008’s Antidotes, held firm against any backlash, and 2010’s Total Life Forever successfully expanded their palette of (largely leftfield) influences. A Mercury Prize nomination was just reward. • Today, they’re less a fumbling creature finding its feet and more the tremendous elephant in the live room - truly, they've become a huge-sounding proposition. Foals were already a mainstream presence; now, they’ve made an album properly reflecting that status. Arena tours should await them. • Holy Fire’s lead tracks, Inhaler and My Number, comprise tone-setters for this slickly realised set, which focuses on instant-click compositions over consciousness-creepers. That both sound enormous may have everything to do with Alan Moulder and Flood’s production – and if not, their presence can’t have hurt. • These insights into a more traditional rock aesthetic are ultimately catalogue highs. They showcase the right manner of group maturity, embracing the core of today’s commercial rock market while retaining traces of trademark twitchiness. It’s a perverse progression: two steps backwards to leap into an unwritten future. • Late Night is a slow-burner that brilliantly erupts in its final third. Of similar design is Milk & Black Spiders, which will be a standout moment of the band’s live set when it, too, bursts with intoxicating vibrancy at its climax, strings rushing into the mix. Stepson and Moon are more delicate affairs, sequenced to impress considerably at the album’s end. • Yannis Philippakis’ lyricism could be dizzyingly cryptic before, but here he’s focusing on identifiable themes: love, friendship, distance, travel. Metaphors are less messy, the language streamlined. He sings with tenderness when necessary, and has developed a satisfyingly gruff roar, best employed on Inhaler. • Holy Fire is somewhat hamstrung by Bad Habit, a peculiar hybrid of The Temper Trap’s Sweet Disposition and Mumford & Sons. It lacks the singular spark that makes this band’s best cuts stand boldly from the crowd. Prelude, too, will likely lose the battle against the skip button. • But such quibbles are minor. The kids – which Foals were at their outset – have grown up splendidly. You might say they’ve become a true thoroughbred outfit, if such linguistic horseplay was your thing. • There's no question that Foals have moved past the indie-dance aesthetic that their earlier material - and even some of the songs on 2008 debut Antidotes - embodied. 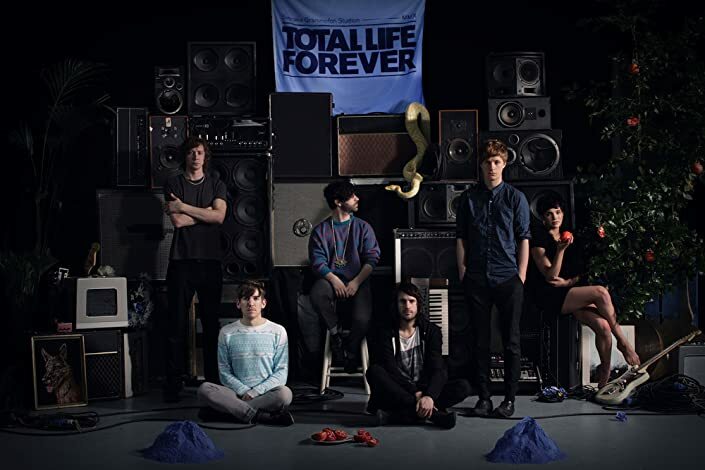 They moved things up several gears with 2010's wonderful Total Life Forever, an album on which the Oxford quintet expressed desire to do their own thing and not get lumped into any 'scene'. It brought them considerable critical acclaim, and the more expansive sound pursued by Yannis Philippakis and co. certainly gave the impression that the band were maturing rapidly. Upon listening to Holy Fire, it becomes clear that its predecessor was the bridge between one era of Foals and another. They had to make it to get to where they are today, and there's no mistaking their third album as the one on which the band realise their full potential. • I realise I may have ruffled a considerable number of feathers with that last statement, but it seems as though Foals are too focused on the here and now to think of what's gone before. They've undergone a thrilling metamorphosis, which has seen them go from gatecrashing the charts with the dance-rock-influenced Antidotes to a band that wear their pop influences on their sleeve. With the exception of the curtain-raising 'Prelude', which works so well as an album opener that to take it out of its proper context would diminish its power, every song on the new record could be a single. Yes, even the stripped-back closer 'Moon'; as unconventional as it sounds, it has a strong enough hook that it would work as a single. That song is the serene coda to an album that constitutes the most impressive body of work the band have produced to date. • Detroit. Willesden. Olympos, on the Greek island of Karpathos. “The inside of our skulls”. These are the places that make up Holy Fire, Foals third album, their most direct and fully realised album yet. Foals have stepped up from, as Yannis puts it, "songs for indie clubs" to something much, much bigger. Their third album might not sound like Depeche Mode or Nine Inch Nails, but it has much of the same ambitious spirit and grandiose aesthetic that led to those groups touching the lives of millions. This is the sound of Foals arriving. • It's all a long way from the group's early years in Oxford, where Yannis Philippakis (26), Jack Bevan (27), Walter Gervers (28), Edwin Congreave (28) and Jimmy Smith (28) convened after spells in various well regarded bands such as The Edmund Fitzgerald, whose intricacies were a league away from the Libertines-influenced indie skiffle and American garage rock that dominated at the time. 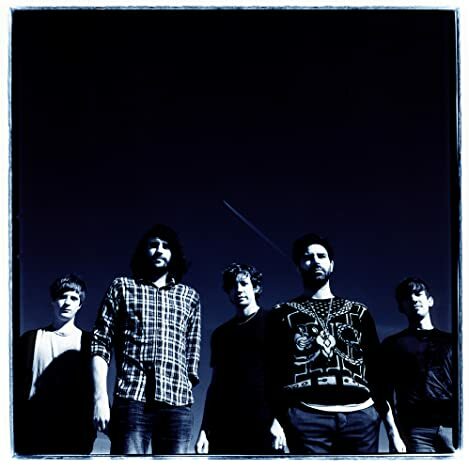 Debut album Antidotes (2008) attempted to capture the live energy and sense of spontaneity that had made Foals one of the most sought-after live acts in the UK. 2010 follow-up Total Life Forever was a surprise to many (Foals never sit still for long) dealing in more expansive, eloquent sounds and a more mellow feel inspired in part by Foals' long-time enthusiasm for weed. Now, as they approach their 30s, Foals are moving on from the "kind of lost boys club element to how we've lived for the past six years" to make their best music yet. • Yannis gives much of the credit for this huge leap forward to producers Flood and Alan Moulder. "The two of them have a knack of taking something that at its core is fairly leftfield or fairly idiosyncratic, and whatever they capture becomes a universal experience," he says. "I'd be lying if I said it wasn't something that attracted us to them. • The feeling is mutual. Alan Moulder, who mixed Total Life Forever, says “I was impressed with their attitude to making a record and their ambition towards achieving something individual and unique but still wanting to appeal to the "masses". • "The band couldn't draw on the external way that it could in the way that it did when it went to Sweden or New York, which were new experiences," Yannis explains. "Whether it was inside our own skulls or in the studio we formed our own worlds, and one way of doing that was to bring in vegetation. It was all quite tropical vegetation. It enhanced the feeling of the pestilence and the swamps on the tracks where it needed to feel sweaty and marshy." • This all became part of the influences that went into Holy Fire, described by Yannis as "The Delta, voodoo, the swamp, sexuality, byzantine iconography and music, syrupy rhythms, the mountains, the abyss, the decline of the bee populations, hip hop and stoner rock." Then there's the folk music of the American Deep South, captured by Alan Lomax just before it passed into history: “most of the players of the music are long deceased, but you can still be part of these moments that were recorded in fields in the Delta," says Yannis. "You feel like there's a direct communion happening between you and a ghost." • "It's pure expression, from the emotion, into the instrument, into the microphone, out of the microphone, into the speaker and then to the listener - it feels like raising the dead for three minutes." Yannis says. "There's something that's exciting for us to feel that every time you put on the record, you commune with something that's in the past." • This approach was an unqualified success. You can hear it on the astonishing, almost bombastic 'Inhaler', the first track to be released from Holy Fire. "It's heavy, that song; it was liberating," says Yannis, adding that it is the sound of the band shedding their inhibitions. "Those songs have always been in us the whole time, and there's always been a self-censorship that's been prior to this. One thing that was liberating was to feel that we could do whatever we want, there could be a radical freedom to it, but it still ends up sound like we do. We could express a new range of emotions, rage or claustrophobia. There's less head going on and more heart." • Yannis feels that Holy Fire features his strongest lyricism to date. "The lyrics for the first album were like a kiss chase with no payoff," he says. "It was just abstractions. There was genuine emotion behind it but I wasn't willing to verbalise it." Now, though with a philosophy of refusing to self censor, it's all there, for everyone. "There might be some utility in that for a 15-year-old who's going to listen to it and get solace from it," Yannis says. Foals have not made a record for those who might think that it is "going to look great with their latte and their loafers. I want to make songs for people who I feel like have been disenfranchised by alternative rock music". • Take 'Late Night', for instance. “Some of that is to do with my grandmother, and to do with ageing, and being on the verge of passing over into something else, and having remorse and guilt." Catholic guilt? "Byzantine guilt… bloodlines, and disappointment, and the unwinding of genes."